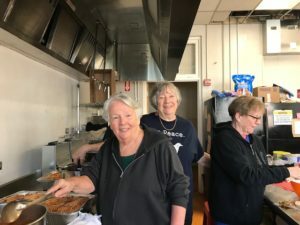 Sisters Joye Gros and Norah Guy and Associate Joanna Magee are ministering to refugees in El Paso, TX. Thanks to Sr. Joye for her “word picture” of what this mission is like. 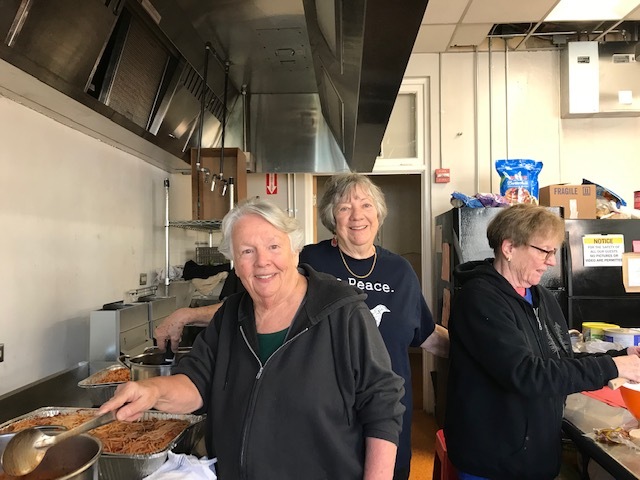 Sister Norah Guy, Associate Joanna Magee, and Sister Joye Gros making one of many meals in a refugee center in El Paso, TX. Because Norah and I worked so long and hard on February 10, Sue, our site coordinator, told us only to work 8 hours on February 11. You see, we had learned at 10:30 PM on February 9 that we were to prepare a noon meal for 150 the very next day, February 10. We did not know what food we had in stock in the kitchen, so we had to go early to pick up keys, take an inventory, go shopping and begin the meal. Since we cooked in one location and needed to transport everything across town, we had to do some other time-consuming things, such as turn on the gas for the stove (which frightened both of us), line the trunk of the car to protect it from pasta sauce, etc. We put the water on to boil. You know what they say about a watched pot! 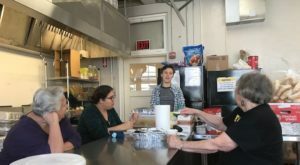 We chopped veggies by the dozens, made five huge containers of salad, mixed garlic butter and grilled buns, and made five huge containers of pasta with sauce. Since the pans we had were aluminum, we had to double stack them to protect from heat and spilling. It served as little protection. We wondered – will it be enough? Will everyone like it?? When we first arrived I had wished I could speak Spanish. Now, I wished I could cook massive amounts of Italian food! We made it to the serving location by 12:30 and created an assembly line in a very tight space. Most of our guests had to eat on the floor in the hall, but the looks of anticipation and the expressions of gratitude eased our concerns. After the meal, Norah and I took all the pans and utensils back to the kitchen across town to clean. Now, we’re talking 10 pans for pasta, five pans for salad, three pans for garlic buns – not to mention the grill, cooking pots, cutting boards… and then we had the stove, counter, trash and floor to clean up.! Those aluminum serving pans have those corner ridges that are hard to clean and harder to dry. With one meal done, we sat down to make dozens of peanut butter and jelly sandwiches for the ‘go bags’. Each family gets a bag with food for the journey when they depart to travel to their sponsor. They are filled according to the means of transportation (bus or plane), the number of people in the family and the length of the journey. If there is a child in the family, we also pack a toy and a soft lap blanket. But I digress… that was February 10. As I mentioned, Sue, aware how long we had worked, said we were only to work 8 hours on February 11. And by the way, would we prepare another lunch for 150? So on February 11, we gave a repeat performance of food preparation, with a little more confidence this time. But confidence doesn’t boil the water any faster. Once everyone was fed, we decided we’d clean up and go home, knowing it’d take longer than Sue suggested. Joanna had been sick earlier in the week, but she was back to her nursing detail on this day. She asked if she could check out one sick child and return to help us clean up and go home. Clean up help – that sounded great! But the sick child needed to go to the doctor with dad. Joanna went too – after dropping Norah and me at the center to clean up. We knew the drill – seeing a doctor with no appointment and no money means a LONG wait!! Norah and I were left at the Center to clean up, make more peanut butter and jelly sandwiches, empty HUGE bags of garbage (it took both of us to hoist them in the dumpster – what a sight!) and clean the refrigerator. Finally we were ready to go home – but wait! Joanna had the car. Dad and daughter at Annunciation House in El Paso. Dad and daughter were delivered. Only Joanna, acting as nurse, had to wait in line be checked out!! I got a text from a volunteer asking if we had any peanut butter and jelly sandwiches – they were out and needed some. We did, but we had no car to bring them. She also needed jackets, stored near the kitchen. Norah and I went to the clothing store and pushed, pulled and shoved two large cartons of jackets to a space near the front door so we could load them when the car arrived. Again, we were a sight to behold! Since they were desperate for our sandwiches, another volunteer came to pick them up. I asked if she would take us home, as it was 7:30 with no end in sight. She was happy to do so. Of course, I offered to fill her gas tank, but would the car start up again? We discovered that GPS is wonderful IF the expressways are open – no matter how we tried, the GPS kept sending us to Interstate 10, with considering Secret Service road closures, was definitely not an option. Home at last… 12-hour shift. Our clothing wears pasta sauce and peanut butter. But we came to serve. We came to be useful. These days have been a rollercoaster of emotions. We’ve been frantic. We’ve been hysterical with laughter. We’ve been tired. We’ve been tearful when we heard “Muchas Gracias” and when we saw parents’ tenderness toward their children, their care for one another, and the looks of relief, hope, and gratitude. As Norah and I struggled to make do with so little, I recalled the story of the Loaves and Fishes; as we bemoaned the inadequacy of our skills, the instruction to Put Out Deeper… and as the dishes piled high, the commission to Feed My Sheep, if only peanut butter! You write as well as you cook! I felt as if I was there. There is a special place in heaven for tired, frustrated, peanut butter spattered folks like you. Thanks. Bless you for your generosity of spirit and tireless service near the border. Your faces beam with love and compassion in the photo. Such welcoming faces so needed by people during a very difficult time. Your guests could take comfort in your presence and substance from all you did for them. Amen! “Well done good and faithful servants!” says Jesus. And your sisters laugh and cry in all that is being asked of you. Blessings to you and our desperate sisters and brothers and prayer for all abound. How wonderful that you are serving the least of our brothers and sisters! You are in my prayers. You made us feel as if we were right beside you spreading peanut butter and love. May God give you all the strength you need to be the hands, feet and heart of Christ. To our neighbors. What an adventure, what resilience, what creativity and what heroic stamina ~ how proud we all are of the three of you and what gratitude we have for helping feed the migrants that we are praying for! God bless you for your super service and loving presence. Thank you for sharing this poignant and powerful account of your loving service to these wonderful people. May god continue to bless you, and all those whose lives you touch in your life saving ministry! Blessings on you and all you made feel so welcome and special. Thank you for your commentary of a day plus as you served others. Thank you ,too, for sharing with your humor. Joye, I was overwhelmed with emotions and full of certitude for all you are doing to help out a little with the horrific situation of the refugees! You are in my prayers that God will give you the strength and energy to carry on! Blessings! What a tiring, but beautiful experience. What Joy that you gave to each person that you served! Thanks so much!! Thanks for the wonderful, detailed description of a day at the border. Thanks for your generous, loving ministry. I plan to go to McAllen in June with a group of SNDs. I recognize Joye from Genesis- Hi!! Thank you for your generosity of body, mind and spirit, it will never be forgotten!!! God Bless. You are the hands and feet of Christ. Thank you, thank you, thank you. Sending heartfelt prayer for all. Not sure whether to laugh or to send emergency services for the three of you!!! But THANK YOU for all you are and are doing in all of our names! I always thought that Dominican Sisters were part of the multiplication of the loaves and fishes! Keep up the good work. Muchisimas Gracias por todo su ayuda, Joye, Nora, and Joanna! God bless you for your selfless sharing and for caring for God’s “little ones” (Little not only in size!) Surely you have been the Face of God to these weary people! Holding you in prayer! God bless you and ALL at the shelter! May God bless both of you for feeding his people. My prayers for all. Thanks for sharing and know you are in my prayers along with all on your staff! Thank you,thank you for being there to represent all of us. I can feel your extreme effort and tiredness, compassion and giving your all. You are grace–God’s life line to all these people. May we be ever so thankful for all we have. Thanks. Real life at the border! God bless you for your generous service.